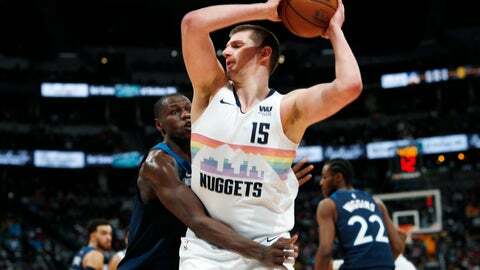 DENVER (AP) — The Denver Nuggets ended their six-year playoff drought in style. After spending most of the season jockeying with the juggernaut Golden State Warriors for top billing in the West, the Nuggets fended off Portland and Houston to earn the No. 2 seed in the Western Conference playoffs and will face the San Antonio Spurs in the first round. Game 1 is Saturday night at the Pepsi Center, where the Nuggets posted the NBA’s best home record (34-7), including a thrilling 99-95 win over Minnesota in the finale that gave them a 12-1 record on the second night of back-to-backs. More importantly, it locked down the coveted No. 2 seed that ensures the Nuggets won’t have to face Golden State, Utah or Houston — against whom they were a combined 3-8 this season — until the conference finals, should they get that far. The novice Nuggets have just three players with playoff experience — Paul Millsap, Mason Plumlee and Will Barton — and the Spurs are making their 22nd straight playoff experience. The Nuggets clinched a playoff spot weeks ago and stumbled down the stretch, losing four of their final seven to make the playing pecking order interesting. They trailed the lottery-bound Timberwolves by 11 points with four minutes left Wednesday night before closing the game on a 15-0 run. The Nuggets know they need to start against the Spurs the way they closed out the Timberwolves, with a sharp focus on energy, efficiency and execution. “We can’t wait until the last two, three minutes to say let’s go win this game,” Jamal Murray said. The Nuggets haven’t won a playoff series since beating the Dallas Mavericks in the conference semifinals in 2009. They have lost their past five playoff series. Despite an injury epidemic that resulted in a constant shuffling of Malone’s lineup, the Nuggets won 54 times in the regular season, tied for second most in franchise history, and they won their first Northwest Division title in nine years. “We had a lot of fun doing it,” Malone said. “We broke a lot of records. We improved in some of the areas that we struggled with last year and the years prior. But to be finishing a grueling 82-game schedule, playing in the West, being the second-youngest team, having a lot of injuries, to be the No. 2 seed is a hell of an accomplishment.